Swingin' Desk Toy Newtonian demonstrator for science teachers. Mindless play for the rest of us. 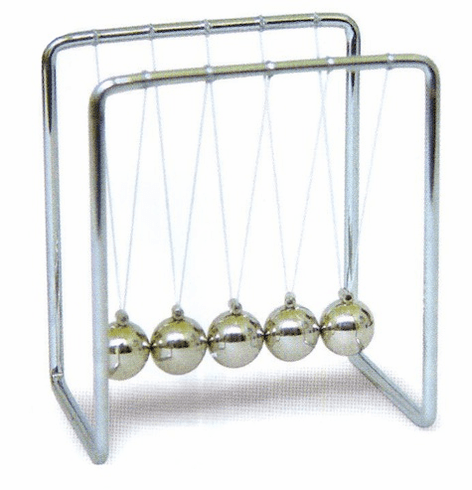 This is a shiny, nicely balanced, high-performance example of the classic Newton's Cradle - a ball on one end of a row of (5) suspended, barely touching balls swings into the others, and the ball at the opposite end reacts to the collision. The 11/16" dia balls in this small version (all-metal frame 6-1/2" high x 4" x 4-1/4") will collide more than 30 times. Awesome. Even more awesome that we paid someone to count the bounces just for you!